P V Indiresan ambassador of School Choice Campaign: Fund Students, Not Schools! Dr. Indiresan is the Former Director of IIT Madras. He has been the President of Indian National Academy of Engineering and the Institution of Electronics and Telecommunication Engineers. 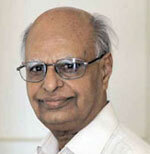 He has also been honored with a Padma Bhushan for his contribution in the field of Science and Electronics in the year 2000.